Seriously this time around, i will surely say MTN Nigeria has offended someone. Why? because if not, this couldn't have happened. I can't even believed my eye when someone tell me this N50 for 5GB data is working until i confirmed it in 3 different sim. But only 2 sim works and get the data. Guys!! I won't like to take much of your time, and right way! Am gonna show you another latest way that you can get and activate the new MTN 5GB data on your sim. Though it might sound funny but it's really true and confirmed by me. The only painful part about this cheat is that, it doesn't works on all MTM sim. 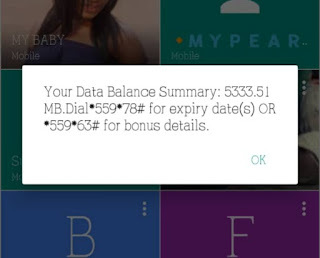 So therefore, this cheat cost you N50 only for you to activate the 5GB data, so if it's not working for you after following this instructions, please, always note i said earlier its sim selective. Because, we can't post non-tested cheat here. So let get started to enjoy this cheat. How Can i Activate MTN 5GB For Just N50? This is MTN cost N50 bundle for Wechat, Which supposed to gives you 50mb only for the wechat bundles. but unfortunately it's also give selects sim users free 5gb bundle ( bonus which can be used on all platform and web without VPN for the whole weeks. First of all, Go to Your Phone Dial Pad quickly dial 👉*662#, Then press 6 follow by, 2 and press 1 to Activate it. ( normal procedure for subscribing for the wechat bundle).